One of the most eye-opening experiences I’ve had regarding death was on a tour of The Island Crematorium in Cork, Ireland. I’d never been inside a crematorium, or funeral home for that matter, and I was very taken aback by how the layout and architecture of the crematorium impacted one’s thoughts as well as emotions. As one of the directors led us around, I found that the atmosphere was very peaceful and seemed to be separated from the outside world; perhaps this was due to the high walls and tunnels or that it is on an island. The director took us into the different sections and rooms of the crematorium and explained what occurred or happened during funerals. He discussed how a ceremony would typical run and even showed us what the audience would see when the body would be taken back to be cremated at the end of the ceremony. The casket laid in a little cut out section of the wall in the front of the room and painted glass doors book-ended each side. Once the ceremony ended, the doors closed together, hiding the casket. To see this acted out, it was very surreal and also I felt like the closing of the doors could act as a type of closure for the friends and family of the deceased. The director took us then to a room with all the urns people could choose from. It was interesting to see the variety in the different kinds of urns. They ranged from small boxes, to vase-like urns or decorative jars and there was even one that was inside of a teddy bear. This tour made me think about how important it is for us, as humans, to deal with death through ritual and made me reflect on how I think about death. Here is a link to the site of The Island Crematorium. It has a really nice virtual tour of The Island Crematorium and I definitely recommend using it! While I normally passively scroll through my Facebook newsfeed, an article posted by a high school friend caught my eye. The article, entitled “The Lonely Death of George Bell,” discussed just what one would assume—the lonely death of George Bell, a 72-year-old New Yorker. Unlike most deaths, the death of George Bell went unnoticed. 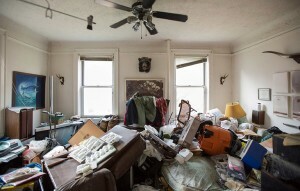 It was not until neighbors complained of a rotting smell, that police discovered Bell’s decomposing body amidst the many belongings that filled his overwhelmingly cluttered apartment. Despite many efforts to identify and contact Bell’s next of kin, no one came forth and his body remained in the Queens Hospital Morgue for months until further investigation was done. Without any family or friends to make arrangements for Bell’s home, belongings, and funeral, the tasks fell upon the office of the Queens Country public administrators. Although a lengthy read, this article recounts the stories of all those who helped put Bell to rest when no one else was there to. From the public investigators who spent hours cleaning out this man’s apartment to the funeral director and undertaker who were the only ones to bid him farewell, each story touches on different aspects of death and subsequently life. With each story a piece of George Bell’s life comes to light and readers learns details of this man’s life and why it may have come to a lonely end. This summer, I had the pleasure of traveling to Ireland with my family and visiting the World Heritage Site, Brú na Bóinne. The most well-known tomb at the site it Newgrange and dates back 3200 B.C. Newgrange is a massive stone structure, weighing over 2,000 tons, and has a single passageway at the end of which human remains were placed. Every year on the winter solstice, light shines through the opening of the tomb, all the way down the passage to where the bodies rested. Although it is impossible to know the exact significance of the burial site, many archeologist suspect the culture regarded the ceremony as a way to guide the bodies into the next life. Some archeologists interpret the hieroglyphics carved into the surrounding stones to indicate the culture considered the sun to be a god, as was common in many agricultural societies who depended on the seasons for food. Because the tomb could not hold many bodies, it is suspected that only people of significance took part in the burial ceremony. Brú na Bóinne is just one example of the many prehistoric burial sites that incorporated the sun and astronomical phenomena into its construction. Perhaps the most famous example is Stonehenge, found just outside Salisbury, England. Also estimated to have been built approximately 3000 B.C., two of the stones of Stonehenge align with the sun on the summer equinox while there is a different alignment of the sun and stones on the winter equinox. Brú na Bóinne and Stonehenge are just two examples of archaeoastronomical sites; such sites were built on every continent except Antarctica. Although it is impossible to determine ritualistic meaning of these prehistoric sites, it is fascinating that such a diverse range of cultures incorporated similar concepts into their burial rituals. As mentioned previously, many agricultural societies considered the sun a deity and therefore solstices and equinoxes would have been major events which these monuments incorporated into mortuary rituals. In the Middle Ages, the Black Plague broke out and left at least 25 million dead. Fear of death quickly began to spread and with this spread come the portrayal of death as the Dance of Death, or Danse Macabre. 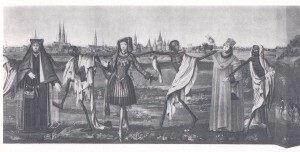 The Dance of Death was drawn as skeletons dancing while dragging or leading people to death. 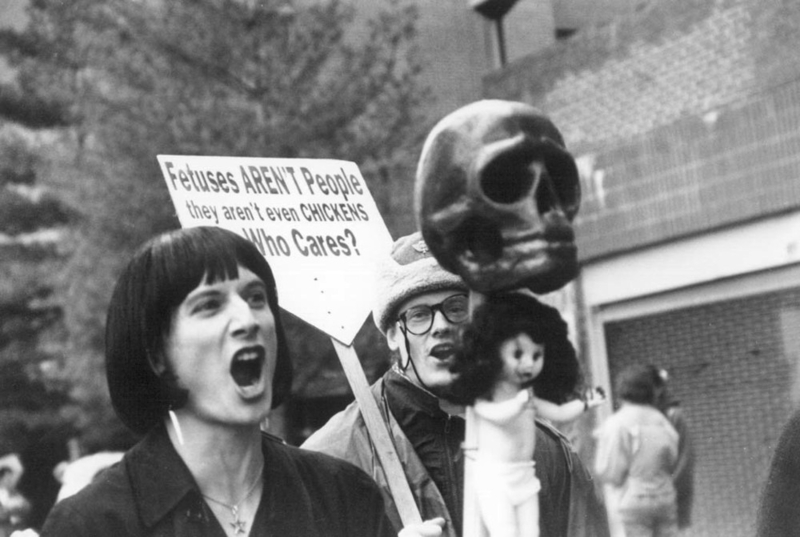 This image led to the myth and image of the Grim Reaper. The Grim Reaper is said to appear as a tall figure in a black robe holding a scythe right before the death of a person. This was once a feared image and that is still somewhat true today. We have grim reaper costumes that are intended to scare others with a skeleton face or no face at all. Also, in television shows there are representations of the Grim Reaper. For example, in Criminal Minds there is a serial killer who is labeled The Boston Reaper. As you can see below, he is dressed in a black sweatshirt with a faceless mask. As part of his killing ritual, he would use their first names as a way to install more fear in them before he killed them, which is similar to the original Grim Reaper who would appear before the death of that person. However, we have also turned the Grim Reaper into a comical characters as well. 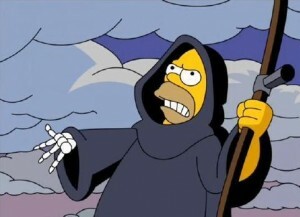 For example in movies and in television shows such as Scary Movie and The Simpsons, they grim reaper is not a serious, scary figure. 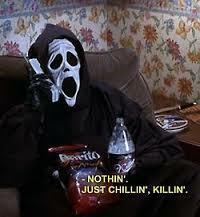 Instead, like in Scary Movie, he is sitting on the couch eating Doritos and talking on the phone. There is also a children’s show originally aired on The Cartoon Network called The Grim Adventures of Billy and Mandy in which two children have gained the Grim Reaper as their best friend for eternity. It is an interesting premise for a children’s show because it not only comically portrays death, but on the other hand it also exposes children to monsters, characters dying after many episodes, and the images of death at an early age. Numerous studies have found critical deficiencies in the healthcare of the dying, such as being unnecessarily prolonged, expensive, painful, and emotionally taxing for both the patient and their family members. Completing an advance directive could offer a solution, enabling people to plan for and communicate their end-of-life wishes in the event that they’re unable to communicate. In essence, advance directives describe four legal documents: the living will, the medical power of attorney, the DNR, and donor registry enrollment form. But they aren’t always about stopping care. They’re about having frank conversations with loved ones, making sure they get the care they want. While there’s little data on advance directives, a 2013 survey (n = 7946) of individuals ages 18+ showed that only 26.3% had advance directives. The chief issue was that many were unaware they existed. Higher advance directive completion correlated with age, education, and income; they were also less frequently completed among non-white demographics. This data points to racial, economic, and educational disparities, a result of several factors, including distrust in the health care system, cultural differences, and poor patient-doctor communication. During the 2009 healthcare debate about legislation to cover uninsured Americans, the government was accused of creating “death panel” where bureaucrats could choose whether the elderly deserved healthcare on a case-to-case basis. They pointed to Section 1233 of HR 3200, which reimbursed physicians for discussing end-of-life care options with patients. The issue was highly politicized. Many of the politicians who had attacked the Affordable Care Act for death panels previously supported advance directives. The result led to a removal of the provision. When the Obama administration tried to add them in to regulations again in 2010, the political climate wasn’t ready, and they backed off. A few months ago, a new Medicare rule was approved, finally allowing physicians to be reimbursed for end-of-life conversations as early as 2016. The underlying logic is that many physicians don’t have time to discuss in-length all of a patient’s end-of-life options without these payment incentives. Thus, the autonomy to decide can become more integrated into the consciousness of the elderly Medicare hopes to help. Even then, I question whether people will be inclined to visit the doctor’s office for mere consultations, if they aren’t receiving treatment or leaving with a prescription. But the majority of Americans naturally avoid addressing end-of-life, so advocacy on the part of physicians to discuss the topic could make the difference. Doctors could be motivated by the desire to cut healthcare costs by pushing patients to avoid potentially lifesaving procedures. In my opinion, they’re more biased towards keeping people alive, because it’s deeply ingrained in their medical culture. To do less may be incompatible with what they’ve been taught. In placing the responsibility of interpreting advance directives on physicians, they lessen the burden on family members during the dying process. Further research should examine how health care professionals react: whether they adhere to, misinterpret or completely ignore what’s written. Discussing death in the United Kingdom was previously considered a taboo topic, despite its inevitability for everyone. Death has always been and will be, an event in which one finds themselves experiencing first hand and/or through friends and family, yet discussing it openly is not socially ‘correct’. This attitude of not addressing the topic both before and after it has occurred is slowly shifting as discussed in the article ‘Anyone for Tea and Sympathy? Death Cafes Embrace Last Taboo’ by Harriet Sherwood. Originating in London, death cafes have begun appearing in various countries to provide a safe space in which one can discuss anything relating to death (pre or post). These cafes are an innovative and well intentioned idea in my opinion as they bring about a topic that most people do not feel comfortable talking to with other people or feel wrong for even bringing up in fear being the harbinger of dark subjects. The ability to be in a safe space to talk to complete strangers (or friends) allows people to explore topics they may not have even thought about, such as after death procedures and preferences. Death cafes are able to bring light and perhaps more lighthearted talk, on morbid issues and help to reduce the stigma and fear that permeates the process of dying. Unlike a wake and more like an AA meeting, people are able to participate at their own leisure and structure their meetups like an open forum. In addition to death cafes, the topic of death is also being embraced through conventions such as the Ideal Death Show and websites like Final Fling. The convention weekend of ‘celebration’ for death is designed with the intention of allowing people to explore after death options such as customized urns/coffins, types of bereavement, discussion panels and other ways in which to handle death in a healing fashion rather than a silenced mourning. Websites like Final Fling are designed to allow people to set up basic procedures surrounding death and helping with their end-of-life planning. Conventions, end-of-life websites, and death cafes are meant to embrace the losses people may have experienced through death by acknowledging it as well as providing persons with company who share a similar loss. They all three also serve to reclaim one’s individual preferences and conceptions from the professionals who have inadvertently (or intentionally) designed the hushed, coveted treatments of the dead. It is unclear where this growing acknowledgment of death in everyday lives and public spheres arose but there are a few theories presented in the article. Some believe it derives from the baby boomer generation currently aging and beginning to face their large mortality rate. Others claim the openness is required due to the reduction of religious guidance (influences from the church) and beliefs of afterlife. Another theory is that is has become more socially acceptable to be ‘vulnerable’ in public versus stoic. I agree more with the last theory however, that people are rejecting the “power dynamics of death and dying” and seeking to have more self-determination in societies where we have cleanly organized and dictated how death should be confined and treated. Humans are curious by nature and the idea to challenge common conventions and discuss taboo topics such as death in a previously thought of “happy space” appeals to them. The article ends with the thoughts that discussing death is not the same as wishing for it- a notion that previously preoccupied minds and is actively being altered through specific measures in order to reduce its taboo status. Additionally, that by addressing death openly, humans are accepting its inevitability, which I think is a step in the right direction in order for healing to take place as well as for people to become more comfortable with end-of-life decisions that are extremely difficult for the survivors to handle without guidance. On the morning of October 14th, the Newsweek homepage had four top stories: one about a plane crash killing two people in Los Angeles, one about a bridge collapsing in Johannesburg and killing two people, one about the democratic debates, and one entitled “U.S. Could Benefit From the Death of a Top Iranian Commander in Syria”. The final article is what you might anticipate — an explanation of how the recent death of Iranian military general Hossein Hamedani might allow the US to exploit Iran’s temporary distraction and disorganization in order to gain military traction in places like Syria and Yemen. While perhaps timely and important news, the article gave me pause. How, in the same week that our nation has been mourning the deaths of Americans lost to gun violence within our borders, analyzing accidental deaths caused by plane crashes and bridge accidents, and hosting political discussions about all of the above, could we simultaneously be celebrating the death of others embroiled in military conflict? What separates tragic losses from strategic ones? Why, if preventable death matters so much to Americans, does war operate outside of the realm of legitimate inquiry into preventable death? Such facts should not come as a surprise. One need look no further than the five o’clock news or CNN twitter page to discover that American wars and imperial projects around the world have caused egregious accounts of combatant and civilian deaths not only through wartime violence, but through the pernicious environments created by war. However, as our populous and elected officials vigorously interrogate ways to prolong and protect American life, they simultaneously encourage and defend our global military entrenchments, ensuring death for others. 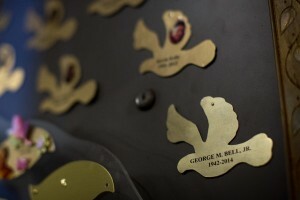 Gun violence, breast cancer, and car accidents captivate the American conscience and engender a sense of common commitment to the prevention of death while targeted strikes, un-collected land mines, military accidents, and environmental damage caused my US military occupations kill thousands of people. From Iraq, to Djibouti, to Somalia, to Japan, the US military is an active contributor to undue civilian death. So why are these deaths not on our political radar? The passivity and comfort with which the American public consumes news about death in wartime is anything but benign. The acceptance of military deaths as part of a strategic set of calculations that operate outside of standard civilian concerns carries heavy implications for the ways we accept or reject militarism and the ways we relate to and construct individuals in American war zones. News articles like the one on Hamedani’s death may just seem like reporting, but such representations of death as “strategic” subtly entrench cultures of accepting some deaths as legitimate, and militarism as an ideological sacred cow. Failures to inquire into and take action to prevent unnecessary death caused by war thus becomes justified by an implicit and untouched understanding of the preservation of US life (and the life of the nation state as an entity), as more valuable than lives lost in the form of collateral damage. Questioning the way in which we consume representations of justified or strategic deaths in war may be crucial to understanding how to better prevent unnecessary loss of life beyond America’s borders, death caused and championed by the American media and political apparatus. I want to discuss why have student become more prone to this violence? Is death being taken more lightly because it is so much easier to purchase a gun? Is it because we see these killing occur all around the country so often? I am not sure. It seems to me that these occurrences seem like a fantasy until they occur close to you. I was personally taken aback by the whole thing. After watching the video it made me angry how lightheartedly the students took the threat. It is said that the threat was a joke, but killing is not a joke. The students who were interviewed kept laughing as they answered the questions, one even claimed that he had not taken it seriously. All of it is fun and games until parents end up mourning their children. To the young adults of today it was common to see threats and death everywhere in the news, it was simple to become numb. Television brainwashes this generation into becoming blind to the cries of people on the screen. It has become such a problem that they are no longer morally repulsed by the idea of getting a gun and murdering their fellow students. There are so many issues surrounding this movement of violence; the ease of getting a gun, the ability to shoot it, the idea of going on a website and posting the plans. It seems to me that the people who keep shooting up schools are drawn to posting things online announcing it, all they want is recognition in a sea of people. The problem being how do we stop this.